Enhanced Beginners Cave is an Eamon adventure written by Donald Brown and John Nelson. This is John Nelson's updated version of the original Beginners Cave by Donald Brown, offered on the expanded master by John Nelson and Jon Heng. The adventure contains all the original content including monsters rooms and items; it also contains various new rooms housing additional monsters and treasures. In its original form, since it was written with a more advanced version of the Eamon program (version 6.0 as opposed to the original 4.0), it also accepts some abbreviations and contains some general program upgrades not found in the original version of The Beginners Cave. As with The Beginners Cave, this is said to be a training area setup by the Warlord and overseen by William Misslefire where new members of the Guild of Free Adventurers may hone their skills and gather some small treasures. As with other beginner areas (except in Eamon Deluxe), characters who are too experienced will be barred from entering by the Knight Marshal. As in the original Beginners Cave, head down the south corridor, checking the various side chambers for monsters, companions and treasures. There are two additional cells containing two new monsters to encounter, plus another weapon to collect. In particular note the bottle in the first west chamber where the Hermit lives, since it is a healing potion, and Be careful of the Mimic who lurks in one east chamber disguised as a chest. It will come to life and attack you when you approach, it is a hard battle though it does yield some treasure. After passing all the cells, continue south. To the west is a ruined library with a magical book and a monster, the Slovobian book eater. Do not read the book since it will turn you into a very short-lived fish, but take it since it's a treasure item. When you come to an area with a rough door-shaped outline on the east wall, examine this to find a secret door which leads to an altar where you can rescue Cynthia, the daughter of a duke from an evil priest. Continue east and down the stairs, then head east once more and take the south corridor. Here you will find further companions and monsters in rooms to the sides of the passage, including the room where the pirates store their treasure and a mummy's tomb with a not-so-valuable cat idol. At the south end the passage forks, with two more passages splitting off east and west leading to a couple more rooms containing monsters such as the Condor guarding its golden egg, and two large chambers containing treasures and further allies or enemies. When you have fully explored all the southern chambers, return to the main corridor east of the stairs and head one east to a cave which is obviously near the seashore. Examine the funny-looking rock in the north wall to find a secret closet containing a python and a ruby. East the tunnel terminates in the Pirate's Cove, where a pirate attacks you with the magical sword Trollsfire. Slay him and take both the sword and the jewels he was guarding. Trollsfire is a magic sword and has a special attack when its name is spoken; however, unless you left some side passages unexplored, you may have already run out of monsters to fight by this point in the adventure. Return along the central corridor, west then up the stairs then north to the Main Hall, where Sam Slicker will pay for your treasure items, and you'll also receive a reward of ten times your charisma in gold for the safe return of Cynthia. Note that since all the treasures from Don Brown's original cave are available plus many new ones, this will also be a more rewarding excursion. There is a very valuable cat idol here. What is a cat idol? Is it an idol carved to look like a cat or something that cats would idolize? Ask John Nelson, he is the one who decided to randomly place this weird item here. Tom Zuchowski awarded the game a score of 5, though he did note this was only in consideration of its status of a beginner adventure and advised more experienced Eamon players to avoid it. 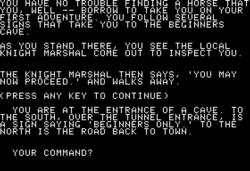 He also considered not giving the Enhanced Beginners Cave its own official Eamon adventure number classification and simply counting it as part of the original Beginners Cave, but in the end decided there was enough new content (plus a new main program), to warrant it being considered a separate adventure. Luke Hewitt also awarded the Eamon Deluxe version of the cave a 5, praising its special and light-hearted atmosphere. He noted that except for completionists, it was likely better to ignore the original cave and just play this one since it contains all the same content along with some new. Since so much is the same as the original Beginners Cave, it is likely that this is not literally a separate cave despite the National Eamon User's Club classification. But it may be the same Beginners Cave at a future time following expansions since no Enhanced Beginners Cave is described in any of the materials we've had detailing the locations of the Guild's training areas, such as Frank Black's short place-holder adventure The Waiting Room. This theory is born out particularly by the fact that one side chamber is described as "the room where the pirates store their treasure". There are also several more friendly characters in the cave, though other than the original Heinrich none are said to be adventurers. In addition to the pirate background, John Nelson provides a reason for the ruin in the library, a book eating monster known as a Slovobian Book Eater, who may or may not be related to Robert Parker's Bookworm. Like John Nelson's own earlier Beginners adventure, Beginner's Cave II, this cave features a tomb containing a mummy, though even for the random nature of Eamon why such a thing should be in a training ground for beginner adventurers is unclear. The cave also contains a treasure chest which oddly enough cannot be opened, but still is bought by Sam Slicker at a high price.